Really enjoyed our stay. Excellent service. Delicious buffet breakfast. New Hotel with good facilities. Very clean room friendly staff. Location very easy to find. I love this place, perfect location, perfect for a peaceful hideaway, recommend for family with little kids, rooms are great huge and comfy. food was good and the staff are very friendly and helpful. Staff were friendly and a room was clean. Personally, I got nothing bad to say about this place. Perfect location midway between jetty and the beach. Staff very friendly and helpful, having stayed at Koh Samet on previous occasions to find a hotel so clean and tidy throughout made our visit an even better experience. Love this hotel and also koh shamed. So close to beach and has its own small bar right on beach. Room (2nd building) was comfortable and clean. Slept well there although had to unplug the alarm clock and fridge to stop the flashing blue light and noises. I got '1 up' from the standard room on agoda site and it included a buffet dinner (average and Thai style), buffet breakfast (average and mix Western and Thai) and 1 hour massage. I could still order food off the menu if needed. There was also live music with an enjoyable singer singing Western songs. Overall a pleasant stay and would come back here again. Lovely from the start, warm welcome, great sea view, clean room with two big beds. Delicious breakfast. Room service was quick a cheap. Had a massage in the Spa, very professional. Very quiet location, we had our own transport so we could get about. Only recommendation would be to put a kettle in the room for tea/coffee making. We will definitely stay there again. I stayed a night at Hop Inn Rayong, location is very good with a food market that opens till late night just in front of the hotel and a big shopping mall just right opposite the street. Room is nice according to the price I paid, they had everything I needed inside the room as per standard. But the bed is fantastic! I wasn't expecting for such a nice bed in this type of hotel. Good quality of the bed and linens. Found the motel to have modern conveniences available, business purposes,quiet and relaxing down time, good gym pool and spa area if you wanted to use, excellent food with romantic setting and live music to share with that someone special. nice and easy hotel. standard service. Free wifi. comfortable for business traveller. Nice small boutique hotel, only 10 rooms, was in a good spot, short walk to the beach, but also close to the bars, shops , places to eat. The small café below it made excellent coffees and the staff were very friendly. My only gripe is it was very expensive for what you got, a tiny room, small bathroom etc... but most of Ko Samet's accommodation is overpriced, so its to be expected I guess !!! The hotel staff was nice and ready to service or help if i had any problem. The hotel is clean, comfortable, quiet and also settled on the good location. Convenient for bussiness traveler and others. If u r after a location thats quiet and away from bar scene this hotel is good value for money, clean and friendly staff. I stayed 2nites. Self contained rooms. near beaches,lot of parking,staff ok. Excellent and relaxing having the beach so close to you only a few steps cross the road. I've been to Koh Samet a few times, and this is the best place I have stayed at! The prices were pretty steep, but only as it was New Years. The location is fantastic, the rooms are really clean and big, lay out is great and the cleaners did a very nice job. Bars and restaurants are really close, pier is 5 minutes away via local vans and I would definitely stay here again! Staff were very friendly and helpful too. The hotel staff were very helpful. When asked about the directions to the beach they provided a map and some recommendations on where to get dinner. Rayong is one of the 77 regions of Thailand that travelers like to visit. Agoda.com has a fantastic range of hotels to help you make your trip to this beautiful Province a memorable one. 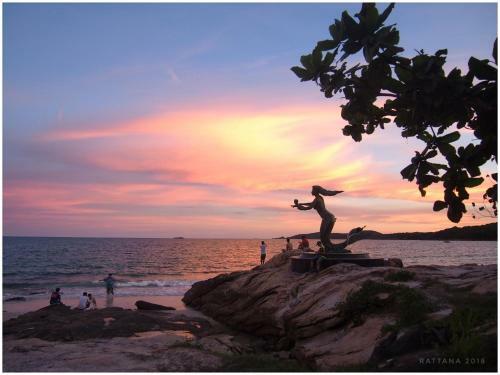 While in Rayong, be sure to visit Koh Samet, Rayong, Khao Chamao. Our website has been designed to help you discover exciting and interesting things to do and places to see. Just as it has hotel options to suit every pocket, Rayong has activities to suit every interest. With availability in more than 22,000 cities worldwide, more travelers today are choosing Agoda.com to search for hotels in Rayong.